It’s e day, 2/7. You know what that means: I’m going to calculate1 e by hand. No calculators allowed. It also means I have to one-up my previous attempt: a tall order, but I think I’m up for it. But before we do that, let me briefly mention a perhaps not-so-interesting property of e: the shaded region below the curve 1/x from 1 to e (seen below)is equal to exactly 1. With that in the back of your head, let’s talk about seesaws. Say you’re sitting on a seesaw with a buddy. You weigh 140 pounds, he weighs 210. How far away from the center should each of you sit so that the seesaw is balanced? Intuitively, you should sit farther from the center than he does, but how much farther? Fortunately, what intuition lacks in precision, physics has in spades. As this picture nicely illustrates, if the weight of the first object times its distance from the fulcrum is equal to the weight of the second object times its distance from the fulcrum, the lever will be in balance. This means that you should sit 1.5 times as far from the pivot as your friend. But what on earth does this have to do with e? Imagine you glued the second weight in the above picture to the lever, and let the first weight vary in size and distance. Symbolically, we let M_2*b = k, where k is a constant. Now we have a relationship between our two variables: the mass and position of the first weight. So what does this relationship look like graphically? k=3 Each point on the graph is a combination of weight and distance that will balance the lever. This is suggestive of a (somewhat roundabout) method for calculating e: get a lever, fix a weight at a certain distance, get a bunch of data points, plot the curve, find the x-value at which the area under the curve equals k, and divide that number by the square root of k. Your answer is e.
First, we need a lever. Because I’ll need to measure distance, a ruler is the obvious choice. Now we need to find a suitable fulcrum. Ideally, we want something thin and hard, so our model will be as close to theoretical as possible. In a perfect world, I’d balance the ruler on a knife’s edge. Despite balancing the ruler exactly at 15m (the middle of the ruler), it consistently tipped to one side. 5 minutes of whittling made the balance perfect. It’s difficult for me to show this in pictures, but the balance is incredibly precise. I actually impressed myself with how sensitive it is. A square centimeter of paper is enough to tip the scale. Next, we need weights. I thought a while about this, and eventually chose safety pins. They’re a little smaller than paper clips, and I have a pile of them in my desk. Now all that’s left is to collect data! 6 safety pins are placed at 21cm, giving k = 36. 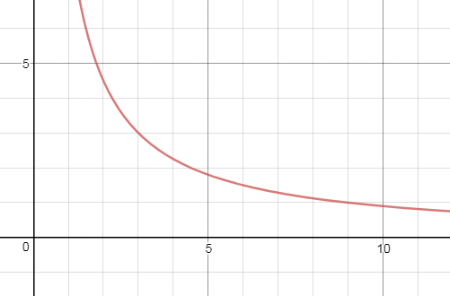 I could compute the area under the curve directly from these numbers,4 but it’s more fun (and more in line with the spirit of this activity) to graph it, then manually calculate everything. 3because 7e≈19, which is greater than the length of the ruler. 4if you actually look at this data, something's amiss. Going into this, I expected to get overestimations for each distance. If the equations spit out a weight of 4.5 (as they do for 8 cm), you would think it would take 5 paperclips to tip the scale. However, I ended up needing only 4. Despite my best efforts to make everything balanced, the scale had a bias towards the left. This turned out to not be a problem, because the lever (over)corrected in the direction of e. I expected to overestimate the integral, and therefore underestimate the point at which the integral equals k, giving an underestimation of e. Because the lever skewed towards the left, I got an underestimation of the integral, an overestimation of the point, and an overestimation of e. I think this discrepancy is due to a lack of uniformity among safety pins and/or placement mistakes (although I was very careful about the later). You should be suspicious of people on the internet doing something like this with data that looks a little wonky, (it's very easy to cheat with this kind of thing) so I wrote this last bit up in the interest of full disclosure.